From military censorship to the government deciding who is and isn’t a journalist, Israeli authorities use various tools to interfere with the press. An important disclosure to our readers. When +972 Magazine was formed by a group of journalists and bloggers over five years ago, its founders decided that the site would not have an editorial line or political agenda save for three common denominators to which everyone was willing to commit: human rights, opposing the occupation, and freedom of information. The first two values are likely evident to almost anyone who stumbles across +972 Magazine, and certainly to regular readers. The third value manifests itself primarily behind the scenes, although in its essence is journalism itself. Col. Ben Avraham, who only recently assumed the role of chief military censor, appears to be expanding her office’s priorities and taking an aggressive new line against new and social media outlets. Prior to this article, in more than five years of publication +972 had never submitted anything to the IDF Censor, although we have published materials from other sites that were reviewed by the Censor. After consulting with counsel, we believe that at this point in time we will have no choice but to submit certain articles to the military censor before publication in the future. And although we are forbidden from publishing the full list of topics that are subject to censorship, they include everything from equipment the army is using in the West Bank, troop movements, the location of rocket strikes, the identities of high-ranking security officials, and certain information about national infrastructure. If and when the IDF Censor does demand changes to one of our articles we will be forbidden from telling you, our readers, when and where we were censored. And while we begrudgingly accept our legal obligation to submit certain articles for prior review, we plan to fight with our full resources any attempts at actually censoring us. The Israeli military censor draws its authority from emergency regulations that have been in place for over 70 years, which originated in the British Mandate period. While other countries have formal mechanisms for requesting that journalists refrain from publishing certain information relating to national security, Israel is all but alone among Western democratic states that have a legally binding state censor. Nowhere else must reported materials be submitted for prior review. Yet censorship is simply the way things have always been done in Israel – a state of affairs that remained effective and possible as long as there was a limited number of newspapers and broadcasters that needed to be censored. As the dawn of the Internet age lowered the entry barriers into journalism and the mass distribution of information, however, the practice of state censorship has often devolved into the realm of the absurd. Information censored in traditional media outlets is simultaneously accessible on private blogs, on social media, and in overseas news outlets available to anyone with an Internet connection. The previous IDF Censor, who finished her 10-year term at the end of 2015, made no secret of her desire to see the entire apparatus become obsolete in favor of a more voluntary — and civilian — system, which would bring Israel in line with other democratic countries. The new censor’s vision, it appears, is diametrically opposed. Contacted by +972, the IDF Censor claimed there has been no change in policy and that individual bloggers have submitted content for review in the past. Asked about its criteria for preemptively contacting bloggers and social media accounts to demand compliance, the Censor refused to elaborate. One blogger who was not contacted by the Censor recently decided to try and submit an article anyway. He was told to “not worry about it,” raising questions about who was indeed sent a censorship compliance letter. Censorship’s most severe threat to democracy is that it limits the press’s ability to act as a watchdog over the government and those who otherwise hold power over our lives. State security agencies, the government and individual politicians often bear interests that can be at odds with the public’s own interest, and an independent press acts as a check on state power. And yet, states can have legitimate secrets. For that exact reason, codes of journalistic ethics and responsibility dictate that reporters and editors must always weigh the public’s interest to know against the potential harm publication might cause. The problem with prior restraint and state censorship is that it allows the state, and the state alone, to decide what is in the public interest. When that decision-making process is unilateral, the conditions become ripe for the abuse of power, corruption, oppression, and cover-ups of all the above. Such fears are not unfounded, certainly not in Israel. The most egregious case in which the IDF Censor was complicit in a government cover-up — that we know of — was the Bus 300 Affair, in which security officials used the censor to cover up extrajudicial killings. The Anat Kamm affair, by the way, also centered on exposing extrajudicial killings. The irony of the censorship regime in Israel is that a lot of censored information gets out sooner or later (see: Prisoner X, Anat Kamm, Bus 300, the Lavon Affair, Israel’s “reported by the foreign press” nuclear weapons program, and on and on). The vast majority of the Israeli press complies with the IDF Censor but a significant portion of the foreign press does not. While a number of major international news outlets and wire services do submit security related articles for approval by the IDF Censor, others take what the New York Times has called the “don’t ask/hope they don’t tell approach” of ignoring the legal obligation, although even that isn’t clear cut. Asked whether it has increased enforcement of the censorship law vis-à-vis the foreign press operating in Israel, a representative of the IDF Censor claimed the foreign press already complies. Asked about those that don’t, she responded that the IDF Censor “can” file complaints with the police, but declined to say whether such a step has been taken in recent years. “We operate in a democratic country and we know the limits of our manpower,” she added. And while Israel (to the best of our knowledge) has not prosecuted any journalists for violating the censorship law in recent years, the government has other ways of leveraging compliance. Yet another way Israel obstructs freedom of information and an informed body politic is through gag orders. The IDF Censor might be looking to expand its reach and authority into social and new media, but it has actually become more timid over the years. For the most part the IDF Censor has raised its threshold of what it is willing to censor, largely limiting its intervention to information it believes could pose an “imminent and immediate danger” to state security. In response, Israeli security agencies — from the civilian police to the Shin Bet to the army to the Mossad — have increasingly asked the courts to step up and act as the guardian of their secrets. Today, in 2016, journalists and editors receive at least one gag order a week via email, fax and these days, even by WhatsApp. Unlike the military censor, which will generally only censor the most sensitive details or ask to change the specific wording of a report, court gag orders can be sweeping — barring publication of any detail of an affair, and often cover the existence of the gag order itself. And unlike in dealings with the IDF Censor, there is generally no press representative (representing the public’s interest to know) to argue against the issuance of gag orders. Illustrative photo by Yossi Gurvitz. But the most problematic way that the state controls information reaching the public is actually the one method through which it exercises the least amount of control: self-censorship. In a media environment that has never existed without various forms of accepted state intervention and censorship, the press eventually starts censoring itself. And that is the most dangerous place we can reach. We at +972 pledge to be vigilant in not letting self-censorship affect our reporting and writing. And yet, everything mentioned here so far is nothing compared to the magnitude and scope of Israeli restrictions and violations against the Palestinian press — both inside Israel and the occupied territories. Late last year, authorities shut down a number of Arabic-language newspapers and publications in Israel associated with the Islamic Movement. Other publications are subject to close scrutiny by intelligence and security forces. 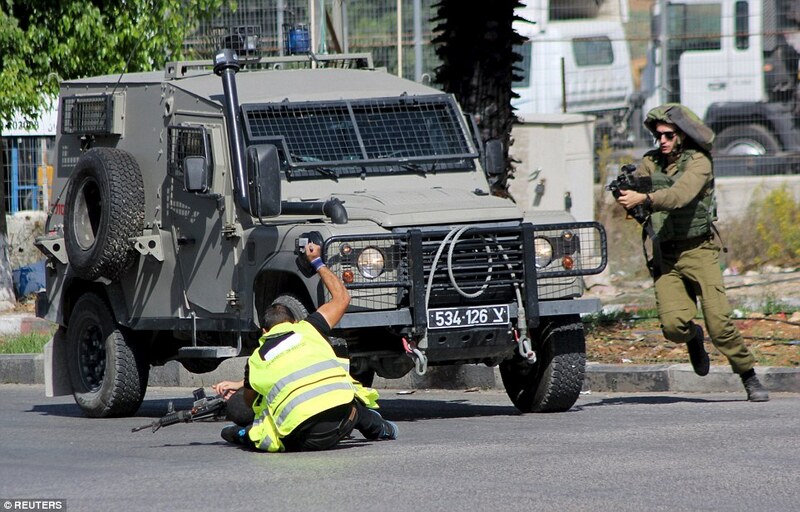 In the Occupied Territories, the Israeli military regularly shuts down Palestinian media outlets, and destroys and confiscates journalistic and broadcast equipment. Journalists report being targeted with violence by the military. Israeli bloggers might have to submit Facebook statuses for censorship but Palestinian journalists are being arrested for posting on social media. Palestinian reporter Muhammad al-Qiq is currently near death due to a lengthy hunger strike against his administrative detention — a practice Israel uses to imprison Palestinians without charge or trial. Israel also severely restricts the movement of Palestinian journalists. Whereas a GPO card allows Israeli journalists to move through military checkpoints freely, even entering areas of the West Bank where most Jewish Israelis are forbidden from stepping foot, the GPO long ago stopped issuing press cards to Palestinian journalists. Palestinian journalists do not have the same freedom of movement that their Israeli counterparts have, and reporters of Arab descent have regularly reported being humiliated with discriminatory strip searches and delays at official events to which they have been invited. Israel ranked 101st in Reporters Without Borders’ Press World Freedom Index last year, largely due to its repression of press freedom among Palestinians. And that is without even mentioning the far-worse treatment Palestinian journalists face at the hands of the Palestinian Authority and Hamas. This article was also published in Hebrew on Local Call. Read it here. Permanent censorship of the media is, of course, one reason why Israel cannot be considered a democracy. It is however disappointing that +972 did not consider refusing to submit articles in advance to the censor. Compliance with the law enables it to continue. Good article. Fight state licensing and band together to ignore new state military censor. Power in numbers. Delve deeper into the self-censorship and authoritarian censorship in West Bank/Gaza. Human rights abuses committed by PA against journos and opposition groups not reported on by most press. Keep in mind despite these challenges, Israeli public dialogue is still more robust and free from PC self-censorship than in the US! Freedom of Speech and Freedom of the Press are Fundamental Rights and Freedoms. However, they are NOT absolute. One of the ways of restricting Freedom of the Press is by means of Gag Orders. Gag Orders place conditions, restrictions or penalties on Free Speech and Press Freedom in the interests of national security, territorial integrity or public safety, the prevention of crime and disorder, the protection of the integrity of ongoing (criminal) investigations, the protection of the privacy of innocent bystanders and/or criminal suspects, the protection of minors, the protection of the right to fair trial before the Court of law, protection of State’s secrets in the interest of National Security, protection of the identity of National Security Agents, etc. The importance of Gag Orders in a democratic society such as Israel and other Western countries, cannot be overestimated. To summarize: “No one has the right to walk into a crowded theater and shout, “Fire!” thus causing people to panic and trample over each other”. The Government of Israel does NOT issue Gag Orders, the Courts do! Before issuing a Gag Order, the parties to the case are heard and are able to concur with or oppose the Gag Order. The Press can and do challenge Gag Orders in Israelis Courts – sometimes with success! To advocate the eradication of Gag Orders as is being done in this article is simply very irresponsible and anarchistic. Abusing Freedom of the Press to incite violence, wanton destruction of other people’s property, murders and mass murders of innocent civilians, etc. is NOT protected anywhere in the world. SOME Palestinian Arab media are used to incite using kitchen-knives, machetes and meat-cleavers to butcher innocent Jews in the streets of Israel or running the over with cars and busses crushing them to death! SOME Palestinian Arabs masquerading as “journalists” have abused the very generous freedom Israel grants to journalists to spy for (human, military and civilian) targets for terrorist attacks and/or for foreign countries and/or entities, propagate and incite (racial) violence and murder of innocent Israelis and Members of the Israel Armed Forces. The restrictions imposed on them are prescribed by law and are necessary in a democratic society, in the interests of national security, etc. Said restrictions therefore serve legitimate goals! There is no case for Israel to answer here. Israel’s Censorship laws are more restricted than that of European countries that are at peace with their neighbors. +972mag and its radical leftist columnists, including “one-staters” those who openly oppose the EXISTENCE of the State of Israel and/or claim that (parts of) Israel proper is “occupied territories” (Sawsan Khalifa et al.) are NOT about Human Rights, Freedom of Speech and Freedom of the Press. They are anti-Israel. They are spreading anti-Semitism either out of ignorance or flat-out malice! I grew up in the early 90s watching old James Bond movies and couldn’t get enough of it, because of the spy intrigues involving beautiful slick babes. Babes are the most beautiful thing the Good Lord ever made! Anyways, James Bond is just movie, not reality. In real life, however, far worse happens – ranging from very rudimental- to very sophisticated forms of spying and identifying “targets” for “neutralization”. Israel is a Master when it comes to spying on enemies. But Israel is also not immune to being spied on. It is no secret that some Palestinians have been recruited in the past as spies against Israeli military and civilian targets by e.g. Hamas, Hezbollah, Iran, etc. They (some that is) are also known for posing as journalists to gain access to sensitive sites, senior Officers of the IDF, etc. Not sure Mike has any idea of the nature of danger Israel and Israeli citizens face as a result of elements within Israel right now who are spying against Israel for foreign masters. If he did, perhaps he would have framed his article differently. This is satire, right? I mean, your putting us on, right? Remember Ahmad Shah Massoud? Dude was an Afghan political and military leader, a very powerful military commander during the resistance against the Soviets, but was blown to bits on September 9, 2001 by journalists he invited to talk peace and stability in Afghanistan and the region. His life would have been saved if those journalists were strip-searched. This year alone, five Palestinians have been charged with spying for Hezbollah/Iran against Israel. The article you linked tells the story of how IDF-soldiers allowed a (Palestinian) journalist to mingle FREELY among them, because he was a journalist. BUT then, that (fake) journalist pulled out his slaughter-knife and proceeded to murder one of the soldiers before being shot. Geez it wasn’t satire. OMG. That’s funny! This has anything to do with +972 having to submit to a censor? How desperately absurd you are. Thanks so much for this pontifical exhortation on the splendid benefits to humankind of gag orders, Eis. I almost gagged but then I realized who was writing it and my laugh reflex overrode matters. I especially laughed, I must tell you, at “The importance of Gag Orders in a democratic society such as Israel and other Western countries, cannot be overestimated.” When may we expect a similar treatise from you on the underestimation of the dangers of government censorship masquerading as a concern for “national security…etc.”? I defy you to cite one +972 article in the past five years (i.e., ever) that genuinely compromised “national security…etc.”? Or was even remotely the equivalent of shouting fire in a crowded theater? If I were you I’d put up or shut up on this. That’s no gag order, just my friendly advice. Pure Soviet/East German police state style censorship. “The Foreign Ministry moved swiftly on Wednesday to change what it termed a “horrible headline” the American CBS news outlet put on its story about the terrorist attack at Jerusalem’s Damascus Gate. This is not the first time that the Foreign Ministry has protested headlines in the foreign media following terror attacks. In November 2014, CNN apologized for mistakes in its coverage of a terror attack on a synagogue in Jerusalem. You are too fond of using terms such as “Eat Germany”, “fascist”, “Hitler”, “brown shirts”, etc. when talking about Israel and Israeli posters. That is an expression of anti-Semitism. Anti-Semitism is a psychiatric illness. Say goodbye to anti-Semitism. Let go of hate! I’d much rather eat France or Italy. You better do that, because you constant infusion of “Hitler”, “brown shirts”, “East Germany”, “the Soviets”, etc. in relation to Israel is clear expression of bigotry and anti-Semitism. Say goodbye to bigotry and anti-Semitism. Let go of the hate in your heart against Jews, or it will destroy you! “Let go of the hate…”. Spoken by someone who has no idea what he/she/it just wrote. What a waste of time that was. There is no hate on these pages but there is a lot of criticism for the zionist enterprise. Jews aren’t zionists. Some are. Some christians are zionists. Zionism is and has been the problem since the end of the 19th century. You want this to be about antisemitism, but it isn’t. That’d make it easy for you if it was, but it obviously isn’t. If this was simply antisemitism, it would have been sorted out years ago. But it isn’t. It’s about zionism and the theft of Palestine. There’s no hate to let go of, that’s just the latest riff from hasbara.com on how to deal with antizionists. The Washington post journalist was **detained** on **suspicion** of having committed a crime, moron, he was NOT **accused** and was certainly NOT ***arrested** or even **charged”. Not intelligent enough to understand those simple things and know the difference, moron? “we heard from someone um somewhere that you was payin’ Arabs to riot” is MORE THAN enough to raise “reasonable suspicion” to detain and question someone all Western countries, moron. The cops had the OBLIGATION to detain him and find out what’s going on. Perhaps someone who is a “journalist” cannot be suspected of a crime and detained? What kind of an imbecile are you? On top of that, you constantly go off on a rant about “East Germany” and the “Soviets”, “Hitler”, “brown shirts”, etc. in relation to Israel and Israeli posters here. That is a clear expression of bigotry, hate and anti-Semitism. Let go of the hate in your heart. Hate kills! +972 is very good, but not good enough. As long as it believes Israel is ‘occupying’ only the West Bank and Gaza, rather than all of Palestine, and gives almost no space to the Palestinian refugees, it might even be part of the problem. The problem being that it is Israel itself that is illegitimate, not just the things it does (e.g. occupy the West Bank, or restrict press freedom) that are bad. But I wonder: does +972 take this conservative position within the media reporting on Palestine because it has been self-censoring, or because it really believes the Jewish state IN PALESTINE should exist? That is, is it a Zionist media site by choice or because it must stay on the Israeli side of the intellectual line?